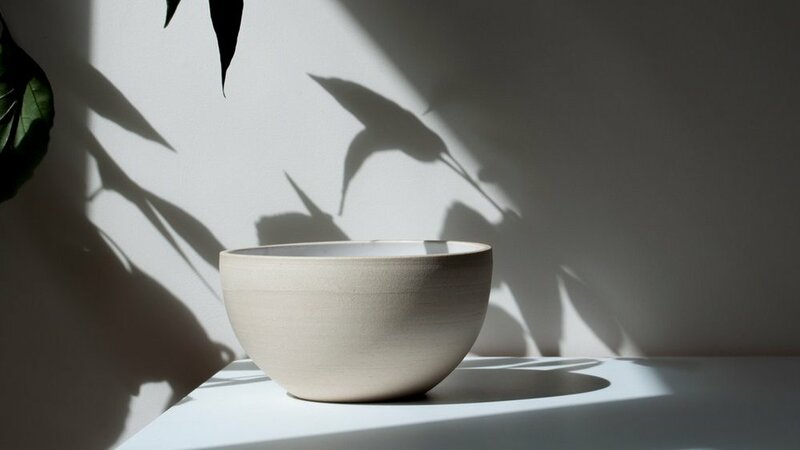 Nestled on the northern Cornish coast, the Dor and Tan studio creates ceramics that are both beautiful and purposeful. We chatted with the team for four who run the studio in St. Ives to learn about their Japanese inspirations, eco-conscious ethos and methods of making. Who are the Dor and Tan team? At our little studio, we have family members Sharron, Matt, Peter and close friend Viola. Between us we have an eclectic bunch of skills, but when put together they have made our project possible. 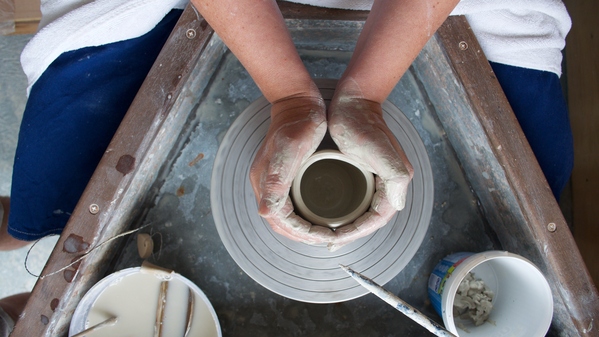 Sharron is our head potter, versed in the art of running a professional pottery studio. She designs all our ceramics and throws most of them. Our whole team helps out and gets their hands dirty in the studio. Taking care of glazing, wedging and the throwing of smaller items. This alleviates some of the pressure on Sharron as a maker and allows her some extra time to get creative. As well as helping out in the studio, Matt runs our website and works hard to keep the whole project ticking over. Peter has extensive knowledge of finance and business strategy. His experience has been vital in getting things moving in the right direction. Viola creates the front end of Dor and Tan, she captures us in her photos and branding. If the role had a title, it would probably be 'creative translator'. You've talked about the value of making products that last – why is that important to you? We feel that making things to last is a notion that is being forgotten in modern day life. We all live in a throwaway culture where objects we use every day hold no value or soul of their own. In Japan and Korea there is a deep running culture of craftsmanship. Items are created by hand with the utmost love, care and attention to detail – they are treasured and used, bringing a softness and character that can't be made in a factory. We intend to make purposeful, everyday use items with this same ethos in our quiet little corner of Cornwall. It’s essential to us to craft ceramics that can age with grace. We strive to create objects using quality materials and techniques, but also with longevity in aesthetics. By making in an ecologically conscious way, we are neutral to the Earth. This is great, but if an item becomes obsolete in a few years, it will be thrown away, or left at the back of a cupboard. As a studio, we don't think this is good enough. Apart from aesthetics, ceramics have the task of withstanding the wear and tear of daily life. 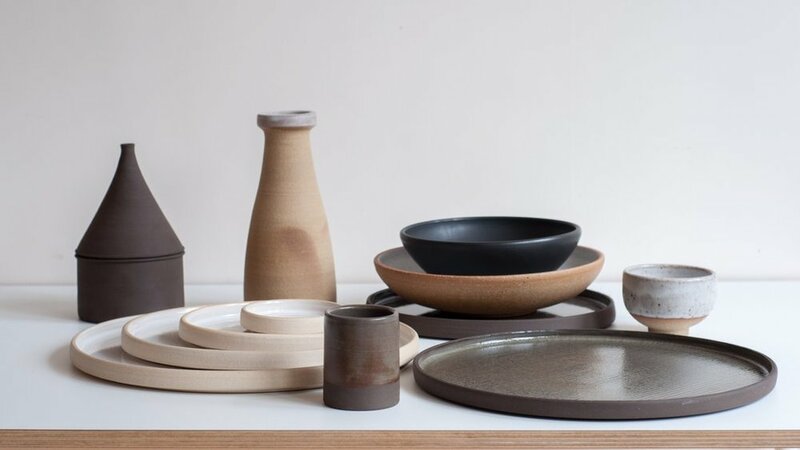 We use our ceramics in our own kitchen every day; if anything chips, stains or simply isn’t ideal for its use, the product either gets refined further, or abandoned. Objects should earn their place in peoples' lives, and, as makers, the responsibility falls on us to create items that will be kept and cherished. How has the environment of St. Ives and north Cornwall impacted Dor and Tan's identity? All of us are avid nature explorers. Cornwall has a way of drawing the wanderer out in everyone, you can't help but be sucked into its rugged beauty. 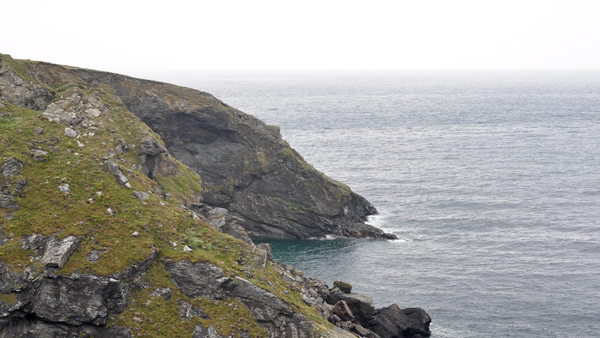 We have a special soft spot for the coastline around St. Ives and St. Agnes. Both are full of wildlife, lichens and rock forms. These natural elements give us an absolute knickerbocker glory of stimulating textures, colours and forms to draw inspiration from. Immersing ourselves in these wild landscapes pushes us towards minimal designs. We’ve learnt to absorb the information of our surroundings and condense it down to its purest form. Being located in St. Ives has also put us on the front lines of what plastics and waste are doing to the environment. It’s hard to stay quiet and not express your ambition to change this when you can see it happening all around you. Our studio has helped with beach cleans in the past (and will do so in the future). To get to the root of the problem though we need to look at how we create and consume as a society. This is where a significant amount of our eco-conscious ethos comes from. From raw materials to finish, could you share with us the process of making one of your pieces? The process of making one of our espresso cups takes about two weeks. That may seem crazy, but clay is a material that makes you work at its pace. 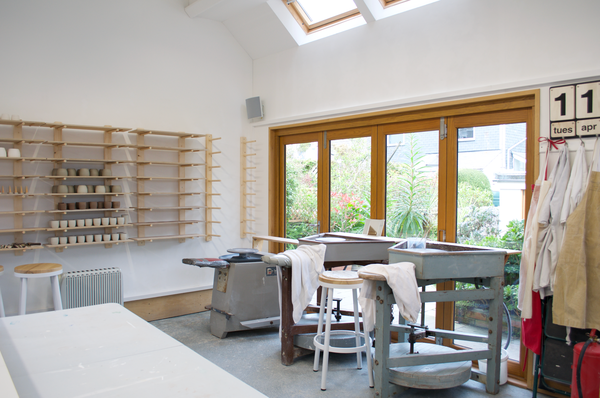 We source most of our clay from Dobles clay pit in St. Agnes, 20 minutes drive from our studio. This clay is first wedged (think of kneading dough) to push the air out and make it malleable. Next comes throwing, where the clay is formed and manipulated into shape. Sharron's personal favourite tool for this process is a Leach modified kick wheel. She powers this archaic machine by kicking a heavy flywheel around an axle producing a satisfying, rhythmic thud. This melody is the heartbeat of our studio, and without it would go into a slumber. Once formed, the clay must dry and harden up. It is then biscuit fired to 1000°C. This vitrifies the clay and makes it porous ready for glazing and a final 1250°C firing. The glaze contains silica which when fired to this heat melts and coats the clay in glass, sealing it. These are the main processes of our work, but to each, there are sometimes dozens of intricate stages of refinement. Every stage is a practical, hands-on process, beautiful, cathartic and rewarding. That's probably why we love doing them over and over again. I'm fascinated by your collaboration with chef and writer Tom Hunt – what was the concept behind the SPSC x Tom Hunt range? We set out to create a culinary experience, enhanced by handmade ceramics designed specifically for each dish. The inspiration for this collaboration was the Chinese five elements. Each course embodied an element but also an associated sense. These are Water (taste), Fire (smell), Earth (hearing), Metal (touch) and Wood (sight). Sharron: 'It is always refreshing to work with someone else. They bring ideas to you that on your own aren’t considered details. When it comes to ceramics and food, they’re usually two isolated worlds. They tend to collide at random in the hope of making something tangible. In this case though, we were designing the experience from the base up. Tom would explain dishes to me that he was experimenting with. He would give me ideas of how he’d enjoy seeing them displayed or experienced. So this is where the initial stages of each piece came from, the chef. I’m often one for simplifying ideas down to their base: What is Metal? It’s smooth, shiny, cold to the senses and connotes tactility. I carried the notion of these minimal ways of thinking to translate each sense to the user. For Fire (smell) I settled on a lidded temple shaped vessel to cup and release the smoke of singe bay leaf. For the element of Wood (sight), I made carafes to pour a mossy green dressing into a shallow matching bowl. The motion of liquid cascading and pooling gave stimulus to the eyes. Every element became embodied by a physical action and sensual experience. The result emphasised the dish and enhanced the dining experience. Discover all of Dor & Tan's beautiful product range at dorandtan.com and if you want to experience their products first hand, along with a great coffee, visit Origin Coffee in London and Cornwall, Finisterre in Bristol or Gleneagles in Scotland. The end of "Made in"